What is Affiliate Marketing for Beginners? – How Does it Work? 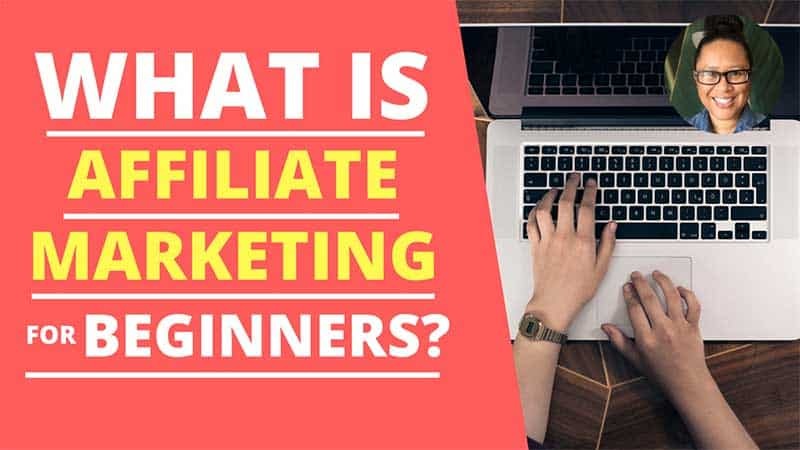 Last updated on December 9th, 2018 EarthaLearn Affiliate MarketingLeave a Comment on What is Affiliate Marketing for Beginners? – How Does it Work? 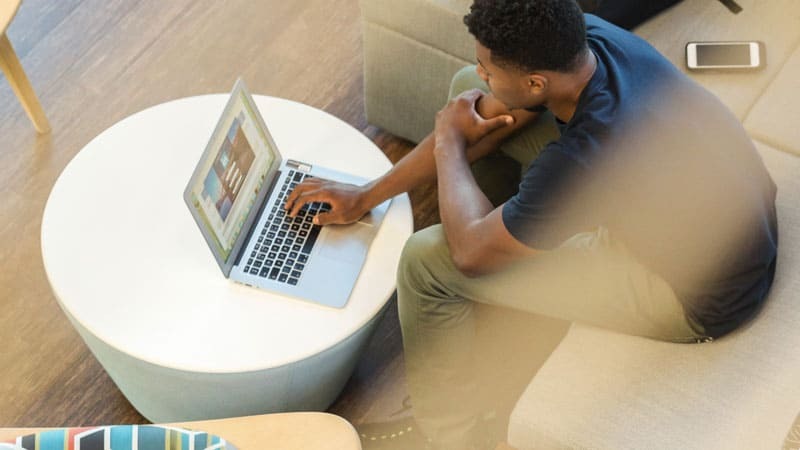 As an affiliate marketer, it is sometimes easy to forget that every day, there are people that are learning about affiliate marketing for the first time. I remember when I first discovered it and how I scoured the web for every bit of information that I could find. 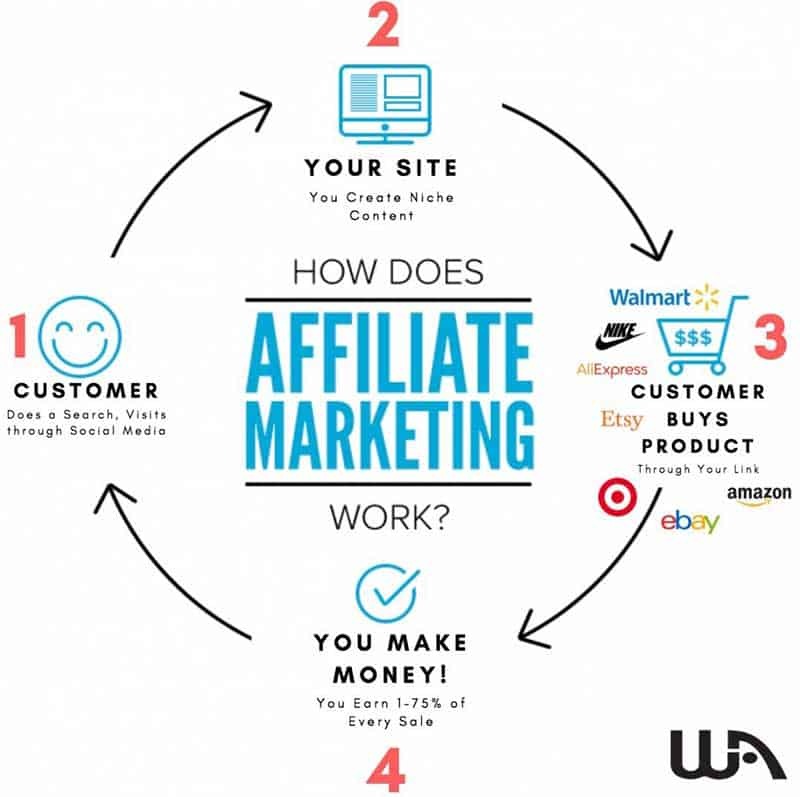 If you are interested in the topic of affiliate marketing, this post will explain what it is and how it works from a beginners point of view. There are many companies that will pay a percentage of each product sale that an affiliate marketer makes. Amazon.com is one such company. So it all begins with a visitor doing a web search (step 1) They may type in a search term in a search engine such as Google or Bing. Or they may find one of your web pages on social media such as Facebook, Pinterest, YouTube, Google+, etc. Their web search then leads to a page on your niche website (step 2). Let’s say the web page your visitor lands on is a review you’ve created for a particular affiliate product. You are also an affiliate of the Amazon Associates affiliate program. Your product review goes over your experience with using the item as well as all of its features. The visitor who is reading your review clicks on one of your affiliate links and is taken to the merchant’s website (Amazon) and buys the product (step 3). Amazon handles the sales process and ships the item to the customer. Amazon then gives you a commission (based on their commission structure) for your referral (step 4). How Do Affiliate Programs Pay You? All affiliate programs have their own commission structures and methods for paying their affiliates. Some affiliate programs pay by check, direct deposit, and the most popular method which is PayPal. They may also have a minimum payout amount such as reaching at least $10 or $25 in commissions. There are over 100,000 different affiliate programs online. Most are extremely easy to find. All it takes is typing in the keyword you are looking for + “affiliate program” or “affiliate”. For example, if I created a website in the camping niche, I could do a search for “camping gear” + “affiliate” in Google. 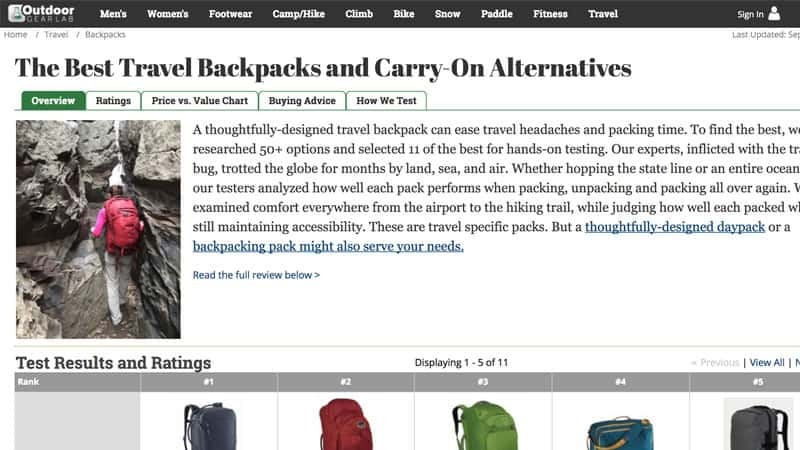 Camping gear companies that have affiliate programs would be returned in the search results. Keep in mind that affiliate programs are free to join. If you ever come across an affiliate program that is charging money, it is likely a scam. An affiliate network is a company that manages the affiliate programs of other companies. Some businesses will have an in-house affiliate program. Other businesses may not want to deal with managing their affiliate program and team up with an affiliate network to handle it for them. Popular affiliate networks include Shareasale, CJ (Commission Junction), Rakuten, Clickbank, Pepperjam, and more. As an affiliate, you can join an affiliate network and apply for the affiliate programs that they offer. Becoming an affiliate marketer is easy. However, there are things that you will need to learn to be successful. You will read about a variety of ways to get started. However, I highly recommend starting with a website. When I got started, I decided to focus on creating a niche website (more on that below.) One of your very first steps is deciding what it is that you want to promote. Part of deciding this is figuring out what niche you want to be in. For example, I am in the make money online niche so I can promote software, hardware, training courses, and more. If your niche was cooking, you could promote some of the kitchen appliances that you use most, utensils, spices, and so on. Once you know what direction you want to go in, you can then find and apply to an affiliate program that carries those products. As you immerse yourself in learning about affiliate marketing, you will definitely come across marketers that solely pay for traffic and those that only use free traffic. There are also those that utilize both. As a beginner affiliate, I highly recommend sticking to free traffic. There is a big learning curve when it comes to paid traffic. Paying for traffic is always something that you can start once you’re earning income from free traffic. Starting off with paid traffic is risky as you can lose a lot of money while you are learning to master it. Free traffic takes longer but once you begin receiving it, it can last for years to come. How Do You Get Free Web Traffic? The way that I get free web traffic is through content marketing. I create content on my blog and social media channels such as YouTube, Facebook, Google Plus, and Instagram. When I write content, I utilize SEO (search engine optimization) which means doing keyword research and writing content that helps to answer people’s questions. I also create video tutorials and post them on both YouTube and Facebook. As you create more and more content, the more you are able to grow free targeted traffic to your website. As I mentioned above, every affiliate marketer should have a website. The easiest way for affiliate marketing beginners to earn income online is by having a niche website. A niche website is typically a blog that focuses on one specific topic. You create content that relates to your niche. You can then apply to various affiliate programs that sell products that you want to promote on your website. I consider this the easiest way for affiliate marketing beginners to start because it is convenient, low-cost, and low-risk. 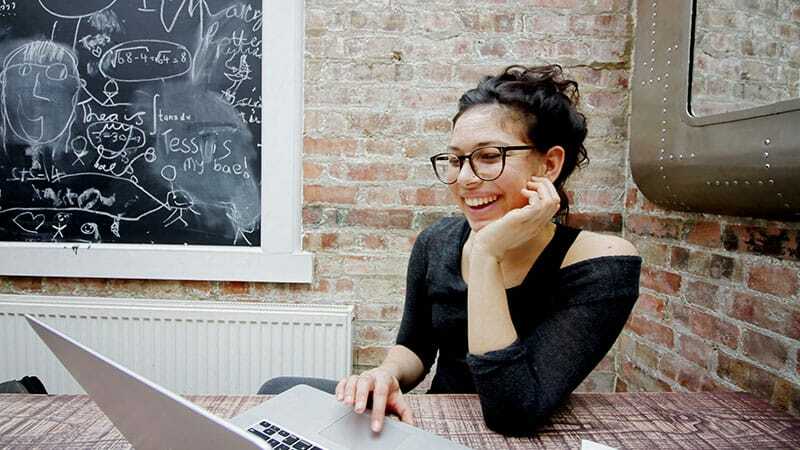 When I created my niche website, I was determined to make it work while I worked a full-time retail job. I was able to fit working on my website during my off time from work. Once my website began receiving free web traffic, it also began generating more sales. I share more information about the steps involved to create a niche blog. Get access to this information with my free online course. Click here to get immediate access. I know that I keep mentioning a niche blog so I want to share some examples of what they look like to give you a better idea. Well, the blog you are reading now is a niche blog. If you explore my blog, you will quickly see that I create a lot of content on how to make money online. 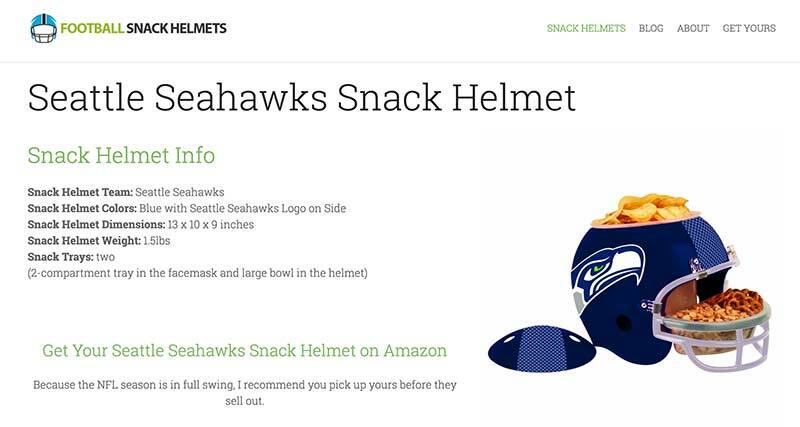 This particular website focuses on reviewing football snack helmets. The owner of the website is an affiliate of the Amazon Associates program. Each time a visitor clicks on one of the affiliate links, they are taken to Amazon.com. If the visitor makes a purchase, the owner earns a commission. This website makes about $300 a day. The owner of this website doesn’t do much blogging but if there were consistent content created on a regular basis, I’m positive the earnings would increase each month. I really love what they’ve done with this niche website. They create reviews of outdoor products. They are very thorough and they purchase every product they review. They are also Amazon affiliates as well as affiliates of other programs. Your niche website doesn’t have to function as these do. So long as you can create content that helps people within the niche you’ve chosen, you can build traffic and earn income. The key is to put people first. When you can help others with your content, the more traffic you can get and the more income you can earn online. Speaking of increasing income online, let’s now take a look at what a realistic niche blogging income looks like. There are bloggers that earn anywhere from $1,000+ to $100,000+ per month. That is the great thing about affiliate marketing. Keep in mind that the above is only an estimate. How much you can earn online is based on your own skills and work ethic. Affiliate marketing remains one of my favorite online business models. Anyone that is willing to learn and put in the time can go far in this industry. After being laid off from one of my previous jobs, I decided to take earning income online seriously. I found an online training program that I liked. I then studied and worked on my business consistently. Be sure to get access to my free online course where I share more in-depth information about the process I use to run my business today.